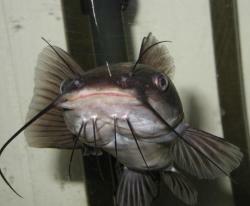 Identification Very similar to the yellow bullhead, for which it can be mistaken for. 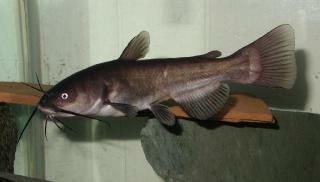 The main difference is the barbels of the black bullhead which are black. 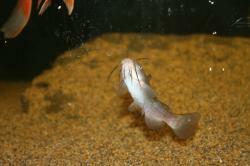 Sexing Females are fuller during the spawning season which begins mid-spring. Distribution Central North America from Southern Canada to Northern Mexico. It has been widely introduced elsewhere in the world. Other Parameters Tolerates poor conditions both in the wild and in captivity. Can survive for a limited time with as little as .5 ppm oxygen concentration and in unusually high temperatures. Feeding Carnivore. 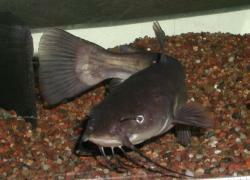 Eats just about anything including minnows, goldfish, crayfish, earthworms and the like. They will accept most frozen foods as well as suitably sized dry foods. Furniture Likes to hide around driftwood and plants. 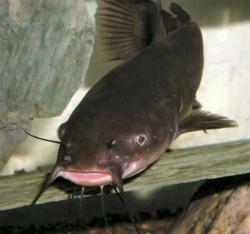 Plants must be sturdy and in pots to prevent being uprooted by the catfish in its search for food. 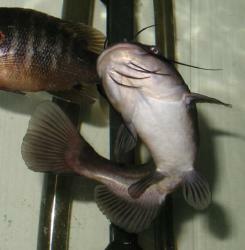 Compatibility Good with most fish, especially larger cichlids. Do not keep with small fish, it will eat them. 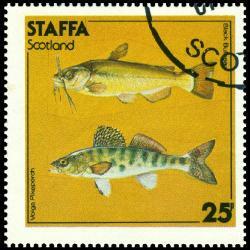 Breeding This fish spawns most frequently during late May and June. 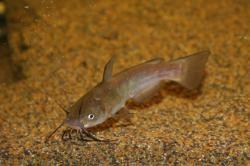 Spawning occurs over sand in reed infested back waters. The females excavates a shallow nest by fin-fanning the substrate and pushing it with her snout. 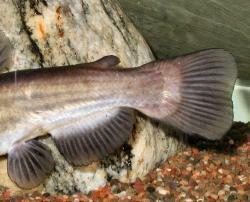 Spawning is accomplished in a head-to-tail embrace, the male wrapping his tail over the snout of the female. Typically 2500-4000 eggs are released.